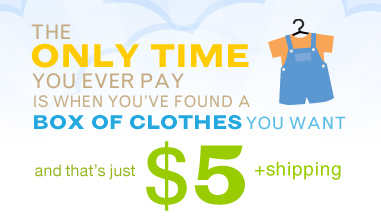 ThredUp is a new online childrens’ clothing and toy exchange that is, in my humble opinion, brilliant. Why? Because they have figured out everything we moms despise and therefore procrastinate about when it comes to either giving away, donating or selling our kids’ outgrown clothes. Don’t buy those things you only use once in awhile—borrow them from your neighbors with NeighborGoods! And while you’re at it, make a new friend or two. Seriously, people are raving about NeighborGoods. We’ve found a site that lets you earn free stuff just by doing the things you already do, like shopping, watching TV programs and playing games. It’s called Swagbucks—check it out on our Deals and Steals page. We just discovered Eco Buys, a website offering major one-a-day discounts on upscale, eco-friendly baby gear. These are serious deals—check it out! We’ve got a coupon code for free shipping at Clinique.com. But hurry—it expires at the end of President’s Day weekend! Come check it out on our Deals and Steals page. Tiny Prints makes gorgeous cards and invitations, but did you know they can also turn your photos into gorgeous personalized keepsake notebooks? Give it a try with this Tiny Prints coupon code worth 35% off personalized notebook! Soap.com is offering $10 off a purchase of $20 worth of Almay products on their site with a coupon code. But hurry—the deal expires 2/16/11! Save on Nestle Tollhouse Valentine Cookies! February is the time to find great deals on luggage. Visit our Deals and Steals page to learn more about this phenomenon and check out the great offer we found at Ebags! Looking for a few key clothing basics for the kids or for you? Now’s the time to save an additional 30% online only. Check it out! Save 70% on Naturalizer Shoes! It’s a new year—is it time for some new shoes? Check out Naturalizer’s blow out sale and you could save 70% on stylish, comfortable shoes that last and last. Here is a way to find good deals on elegant home decor and unique and beautiful gifts in one place: One King’s Lane. They offer deep discounts on limited, one-of-a-kind, artful finds. Check out them out here! Want to get a gift with purchase every time you buy cosmetics? We found a website that helps you do just that. Check out our insider scoop now! Bargain Fish at Whole Foods! Fresh fish is a great food to feed your family—and surprisingly easy to prepare—but sometimes it can be pricy. Here’s geat news about an upcoming sale on fresh fish at Whole Foods! Go fish! Starbucks is offeing a free $5 Starbucks gift card with the purchase of any 12-pack of Starbucks Via ready brew. But hurry—it’s only good this Tuesday, December 21st and Wednesday December 22nd. Ho ho ho! New Pasadena Toy Store: But Hurry, It’s Temporary! Big news for my compatriots here in Pasadena: an actual toy store within city limits that sells regular toys under the $50 price point! But hurry, it’s just here for the holidays, and then it will disappear like yesterday’s egg nog. Free shipping on all LLBean.com orders—no minimum! For the holidays, hot cosmetics brand Stila is having a blowout warehouse sale online. Snag some great deals on stocking stuffers for friends and family and save some serious cash, too!